Every so often one stumbles across a piece of art that lingers in the mind because it so gracefully solves an issue of visual representation; whether that be capturing an elusive emotion, an understated feeling, or in the case here, the sight of sound. The thirteenth century image of Kūya 空也 (903-972), an itinerant Japanese Buddhist priest, resolves this issue economically and elegantly, portraying a string of miniature buddhas emerging from his mouth. Kūya is shown in the act of devotional chanting, or more specifically, singing the praise of Amitābha Buddha. This buddha, different from our historical Buddha, resides in another world, a paradise known in East Asian scriptures as the Pure Land (jingtu 淨土 in Chinese), where he awaits his devoted faithful to arrive through rebirth. One of the main spiritual mechanisms to ensure one’s rebirth in the paradise is the recitation of Amitābha’s name, precisely the act the Buddhist priest Kūya is performing. The trust in Amitābha and his paradise, as well as the various regimens of practice surrounding rebirth there, constitute a style of Buddhism simply referred to as Pure Land Buddhism. For those unfamiliar with the actual practice of Buddhism in East Asia, one might be surprised to hear that Pure Land practices are among the most widespread and popular; far more Buddhists show devotion to Amitābha, for example, then sit in regular meditation (“Zen”) practice. The reasons for the general lack of understanding of East Asian Buddhist practices has its roots in the types of Buddhism with which the West has preferred to engage, namely with Indian , Japanese Zen, and Tibetan forms being the most important, to which can be added the recent surge in Thai and Burmese derived meditation practices. Some may also note the apparent congruity with Christian ideas of Heaven as another reason those seeking “alternative spiritual paths” have shown less interest in Pure Land, or even dismissing it as not “real” Buddhism. The beliefs and practices of Pure Land Buddhism have a long and rather interesting history that developed out of early Buddhist traditions, and this history will better situate anyone who visits a contemporary Buddhist monastery in East Asia or aspires to understand Buddhist practice around the world. If we take the current scholarly estimate of when the historical Buddha passed away at around the year 400 BCE, the belief in Amitābha developed a full four to five hundred years after his death. With the beginning of a new movement in Indian Buddhism, termed the Mahāyāna (“Greater Vehicle”), around the first century CE (the precise dating remains elusive to scholars), the pantheon of buddhas expanded to include figures that resided in different worlds. Amitābha was regarded as the buddha who resided in the West, presiding over an ideal world with other beings, called bodhisattvas, who would assist anyone who achieved rebirth there. Of course, if we were to take an insider perspective, the historicity of Amitābha is irrelevant, as he has long been presiding over his Pure Land, named Sukhāvatī, and will continue to do indefinitely into the future, as one of his many attributes is that he has an infinite lifespan, thus forever allowing people admittance into his paradise. If we return to a historical lens, the popularity of such a salvific figure should not be taken as a fore-gone conclusion. While Amitābha undoubtedly developed within an Indic cultural sphere, there is little evidence that he was widely celebrated there. For example, scholars have only identified two Indian inscriptions prior to the seventh century bearing Amitābha’s name, and moreover, in the records of Chinese pilgrims who made their way to India in the same period, none make mention of worship to this figure. This is a radical departure from contemporary Chinese forms of Buddhism, where Pure Land practice had developed into a mainstream Buddhist activity by the seventh century. As history repeatedly tells us, fame is a fickle thing. Devotion to Amitābha first entered into Chinese consciousness through translations of Indic Buddhist texts starting in the second century. Arguably, however, the most important touchstone of early Chinese Pure Land activity took place in 402. That year, the Chinese monk Huiyuan 慧遠 (334-416), along with over one hundred devoted followers, made a solemn vow to be reborn in Sukhāvati. Amid a ritual that employed burning incense and scattering flowers in front of a statue of Amitābha, this cohort made a covenant to help one another attain rebirth in the Pure Land, no matter how many lifetimes it would take for all to achieve such a goal. This lead to the foundation of the White Lotus Society 白蓮社, a group of monastics and laypeople all bound and aligned for this cause. For this reason, later Buddhists – at least ones interested in such historical affairs – would point to Huiyuan as the founder of the so-called Pure Land School. In reality, there would be no firm filiation between Huiyuan and later advocates of practices leading to rebirth in Sukhāvati, other than the widespread recognition, not apparently realized in India, that devotion to Amitābha Buddha was an available path to the release from worldly suffering. But what religious practices did this devotion to Amitābha consist? The main component as developed by Chinese Buddhists in the medieval period was quite simple. It involved focusing one’s mind on Amitābha, borrowing a similar mindfulness practice of continuously calling to mind the Buddha, called buddhānusmṛti (or in Chinese, nianfo 念佛). In practice, however, the Pure Land adaptation also involved verbally invoking the name of Amitābha in a six-character formula, Namo Amituofo 南無阿彌陀佛, meaning “Homage to Amitābha Buddha.” Looking back at the monk Kūya, we see six buddhas emerging from his mouth, one for each syllable of this devotional phrase. While later Buddhists would debate over the number of times this phrase needed to be recited, or the sincerity and faith with which it should be said, the principle was the same; by engaging in this practice one could be reborn in Amitabha’s Pure Land. Many scholars argue the simplicity of this practice was one of the main factors belief in Amitābha spread so quickly throughout China and eventually into Korea, Japan, and Vietnam (and recent scholarship has included its prescence in Tibet as well). Just because the practice may be seen as simple does not mean it was not taken seriously nor without utmost sincerity. The value of being reborn into Sukhāvati is countenanced in several of the scriptures extolling the virtues of Amitābha. More significantly, besides being a veritable paradise (for example, the temperature of bathing pools spontaneously changes according to each person’s desire), the Pure Land allows for the rapid attainment of enlightenment due to the direct teaching of Amitābha as well as numerous other mechanisms that expedite the process. Importantly, while rebirth in the Pure Land is the proximate goal for most practitioners, it is ultimately subsidiary to the final goal of enlightenment, of which Sukhāvati provides the most optimal environment. Discussions evolved, which are still at the heart of Pure Land today, questioning the precise location of this paradise. Using a simplified typology of “there/then” and “here/now” we can examine the basic scope of this issue. For some, the Pure Land is a place that can only be attained in rebirth after bodily death, constituting the there/then model. 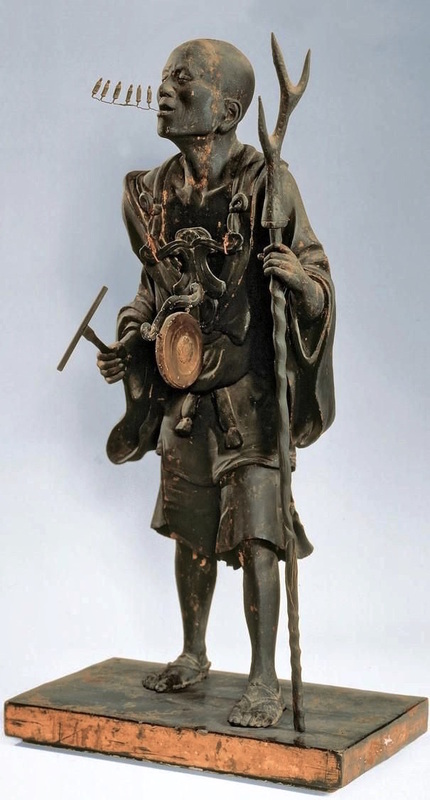 This is perhaps the most evident in the belief that Amitābha will appear to the faithful on their deathbeds, of which serves as a particularly rich motif in Japanese Pure Land art. For others, by mindfully intoning Amitābha’s name one can “attune” to his enlightened state of mind, thus creating a Pure Land here and now from the perspective of the practitioner. This stance is also bolstered by a guided meditation practice where the Pure Land is slowly built up through a series of visualizations. Furthermore, based on ideas deriving from these views, the modern Chinese movement of Humanistic Buddhism 人間佛教 seeks to establish a Pure Land on earth through social engagement focused on helping the living, such as through disaster relief, hospice care, or general charity work. The potential tension between these two models of there/then and here/now has rarely been a true point of contention, and many Pure Land practitioners will rather point to the complexity and depth of the tradition and its practices. In time, important distinctions developed in the theoretical underpinnings of Pure Land practices in Japan and China, of which the Japanese monk Shinran 親鸞 (1173-1263) was highly influential, but the basic contours remained the same. Notably, however, the strict sectarianism of Japanese Buddhism that created a distinct Pure Land School never reflected the state of affairs in China where Pure Land practices remained a common vernacular for all strains of Buddhism, including the Chan (or Zen) lineages. Ultimately, the telltale signs of Pure Land practice manifest themselves frequently in modern Buddhist temples. It is quite common, for example, in Chinese Buddhist temples for monastics and laypeople to greet, praise, or express gratitude to one another by saying Amituofo, a shortened version of the devotional formula simply meaning “Amitābha Buddha.” This is likely a logical extension of a practice extending back over a thousand years when the Pure Land teacher, Yongming Yanshou 永明延壽 (904-975), advocated for reciting Amitābha’s name as often as possible. A more modern expression of this is found through the use of “chant boxes” which play Amitābha’s name on a continuous loop, reminding the faithful of the promise of the salvation found through the Pure Land. Moreover, depictions of Amitābha and his paradise are also very common, not only as statues on shrine altars, but also on devotional posters and other signage posted throughout the temple by devotees, setting the stage for the Pure Land to be realized in the present moment. These multisensory modes of interaction with the Pure Land are exemplified in the image of Kūya. Not only do we see images of Amitābha Buddha, but we are also reminded that by saying and hearing his name one engages in activities that have long been seen as a venerable and wildly popular form of Buddhism in East Asia. And as we can see in the detail of Kūya’s face, heart-felt devotion lingers as well. *This is a draft of a post designed to provide travelers and students a practical history of Pure Land Buddhism, primarily it is intended for participants of the Woodenfish Program, but I hope it is useful to anyone who stumbles across it! Amituofo!